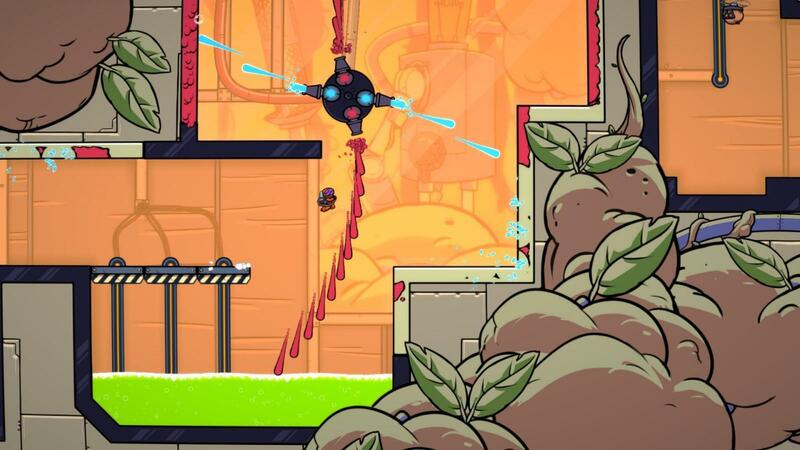 Splasher is a platformer from developer Splashteam. The designer of the game is Romain Claude, who was a Game Designer/Level Designer for Rayman Origins and Rayman Legends. 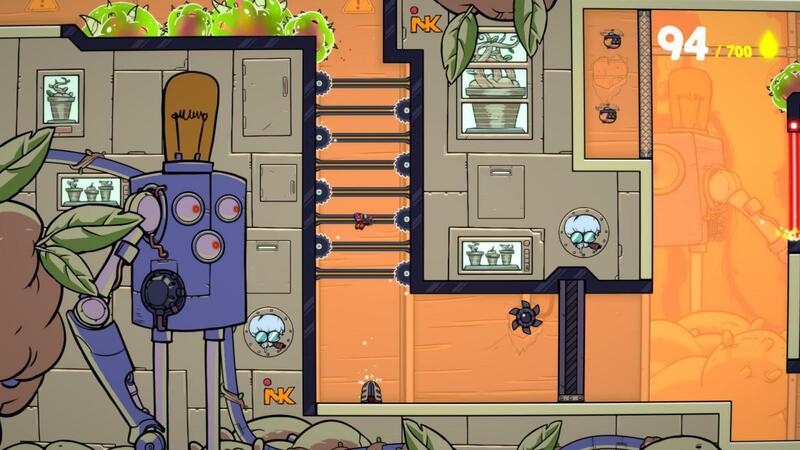 Splasher puts you in the shoes of a lowly janitor working at some huge mega corporation. During your daily duties, you accidentally stumble across a mad scientist conducting some horrific experiments on your fellow employees. The scientist discovers you, and since he doesn’t want any witnesses, you must now flee. The story takes a backseat after the intro cutscene though. This game is in a sub-genre I refer to as “perfectionist platformers,” games like Super Meat Boy, Dustforce, or 10 Second Ninja X. The platforming is the star of the show here. You proceed through levels that contain an obstacle course of hazards and enemies, and if you get hit, you die. For the most part though, I found this game to be a little bit more lenient than the others. The main gimmick of this game are red and yellow paints which affects how you move. Red paint will cling you to a surface, allowing you to traverse along walls or ceilings. The yellow paint will send you bouncing off of it, effectively serving as a sort of super jump. You also have a water cannon that you use to attack enemies and can clean up the ink, if it happens to be a hindrance. Utilizing the paint and how it affects your movement is necessary to completing each level. Obstacles include lasers, acid pits, saw blades, and spikes. Solid ground is pretty much your only friend here. Enemies serve mainly to slow you down rather than actually pose a significant threat. There are enemies that can charge at you or shoot at you, but generally all are easily dispatched. Some are crucial to kill though, as they’ll raise platforms needed in order to progress. Levels also have collectibles, which come in the form of other janitors to rescue. There’s six in each, and getting them usually requires some tricky and precise platforming. In order to get the final janitor in each level, you have to collect 700 of some mystery liquid throughout the level. This is acquired by killing enemies, saving other janitors, and also found on the ground, which can be collected by shooting at it with your water cannon. You get two upgrades throughout the game. One gives you the ability to spray red paint, while the other gives you the ability to spread yellow paint. As the game goes on, levels start to not have any paint in place at all, and it’s up to the player to utilize these tools for themselves. It’s a great way of teaching players a mechanic. By the time they get the upgrades to do this, they know how to fully take advantage of the paint. In addition, there’s also certain surfaces the paint doesn’t cling to, which the game teaches you as well. Using the paint is pretty intuitive, though smoothly implementing it into your movement requires some dexterity. You can quickly flick the control stick downwards, spray a bit of yellow paint, and super jump off the ground. It essentially works as just a longer normal jump, though it requires more inputs. Climbing on walls with the red paint also requires you to point your control stick towards the wall. I questioned whether requiring these extra inputs was necessary, as opposed to just letting you cling to walls or doing a super jump by pressing a single button. I feel mechanical mastery is the focus of the game. They didn’t want you just jumping through the levels with ease, they want you to have to earn it. That way when you breeze through a level or see someone else do so, you can appreciate the skill that went into it. Moving around also just feels really good, so having to do some controller gymnastics is worth it for the amazingly fluid movement. The difficulty curve in the game is pretty smooth. You do die easily, but there are multiple checkpoints in each level, and you’ll respawn at the last checkpoint you passed. There also isn’t any sort of timer or ranking system, so you can play as sloppy as you want, and the game proceeds all the same. I found it quite a bit easier than most other games of its kind, up until the very end. The last level is a very demanding challenge, and tests you on all of its level gimmicks. On top of that, you have to race against an ever rising tide of deadly acid. Splasher is never unfair though. It presents all of its challenges to you, and you simply need to find the best path through everything. It never relies on cheap tricks or situations you haven’t been in before. The best way to introduce a new level gimmick is in a relatively safe environment, so that the player can learn how it works without risk. This game definitely does that, but by the end, the training wheels have long been removed. The game slowly teaches you everything you need to learn, and then tests what you’ve learned. 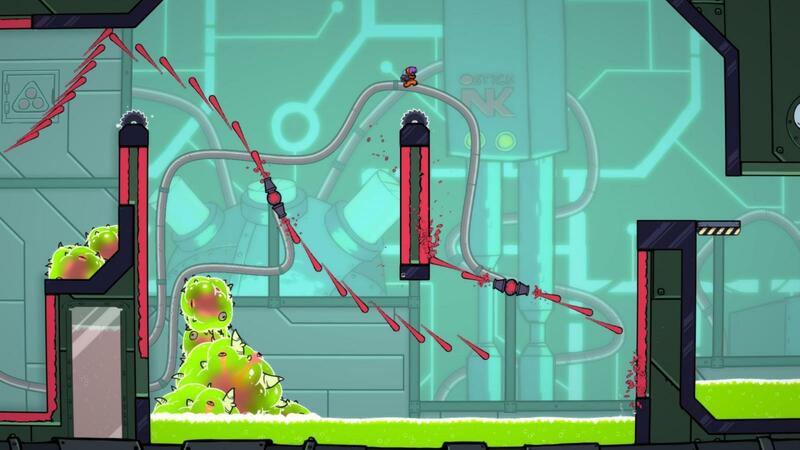 Splasher is a short game, only 22 levels in total, which you can get through in a long afternoon. Much like other games of this nature, levels are meant to be replayed until you get that one perfect run. In addition to the standard gameplay, you can switch to a time attack mode and compete with others online for the fastest time. 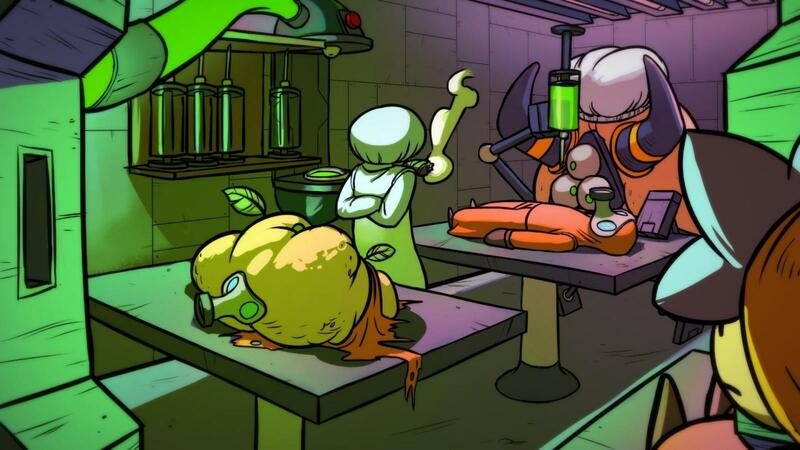 Splasher’s artstyle has a cartoon quality to it. The cutscenes in particular look like a high budget Flash cartoon, and I mean that in the best way possible. The levels carry this aesthetic with lots of bright and vibrant colors, and it’s just very pleasing to look at. It is an indie platformer, and within that sphere, I think this game looks quite good. The music is also noteworthy as well, composed by Aymeric Schwartz, who also previously worked at Ubisoft, and on Rayman Origins. It’s a lot of pumping electronic music, which fits the game perfectly. Splasher is a very good platformer, to put it simply. The only hesitation I’d have to recommending this to everyone is if you just don’t like 2D platformers. I play a lot of indie platformers, and this is one that I think I’ll remember, perhaps even come back to. It’s only $15 too, so it’s a good value. Movement feels amazing, level design is excellent, and I definitely hope to see some kind of follow up from these guys.